OpenVPN is a full-featured open source SSL VPN solution that accommodates a wide range of configurations, including remote access, site-to-site VPNs, Wi-Fi security, and enterprise-scale remote access solutions with load balancing, fail-over, and fine-grained access-controls. Starting with the fundamental premise that complexity is the enemy of security, OpenVPN offers a cost-effective, lightweight alternative to other VPN technologies that is well-targeted for the SME and enterprise markets. You may want to install PHPki to manage easily your certificates. The current version has mainly be written to allow smartphone device to be able to connect as bridge interface are not supported. This contribs is really minimal and doesn't have a panel to configure everything. You have to configure all by hand. Create a new certificate for your OpenVPN server - make sure it is a VPN server only certificate. You can now add your Client certificates to your device. Make sure you have a user on the server. Make sure in your device that you choose Certificate + Password as an option. You can connect using the free OpenVPN Connect app. Unfortunately, configuring this app for your connection is a somewhat involved process. It will require creating or downloading a PKCS#12 file manually for the client, creating a .ovpn configuration file, installing the CA and client certificates on your iOS device, and finally importing the .ovpn configuration file into your device. You may replace MyClient with whatever client name you wish. In processing this, openssl will ask for a password; you must enter one. When the system returns to the shell prompt, your client.p12 file will be ready to use. The .ovpn configuration file tells the OpenVPN Connect client how to connect to your server. Begin by logging into the server-manager and going to OpenVPN-Bridge on the left sidebar. Click the button marked "Display a functional client configuration file." Copy the text that's shown into your favorite text editor and save it as client.ovpn. You'll then need to make some changes. Email the ca.crt and client.p12 files to an account that your iOS device can reach using the built-in Mail app. Using the Mail app, open the message and tap on the ca.crt file to open it. The device will take you through the steps of installing the file, and once it is installed, will return you to the message. Then tap on the client.p12 file and follow the prompts to install it, including entering the password. Again, once it is installed, you'll be returned to the email message. 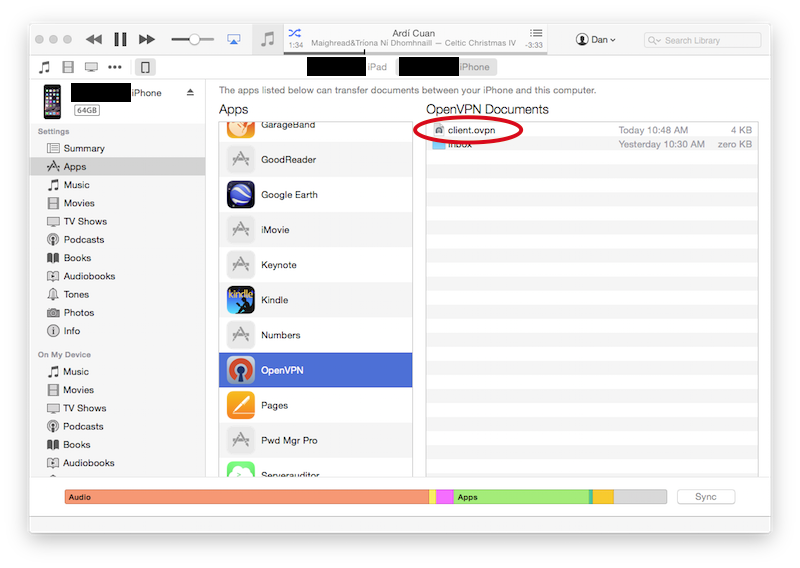 To configure the OpenVPN Connect app, you'll need to copy the .ovpn file to your device using iTunes. Open iTunes, select your device, and choose Apps from the left sidebar. In the right-hand frame, scroll down to the heading "The apps listed below can transfer documents between your iPhone and this computer". Under that heading, scroll down in the apps list and click on OpenVPN. Drag and drop the .ovpn file to the right-hand frame, under the heading "OpenVPN Documents." This will take a moment to sync. Once that is completed, open the OpenVPN Connect app on your device. It will inform you that there's a new profile available for import. On that screen, tap the green + button. The app will open the profile and indicate that it isn't associated with an identity by showing "None selected". Tap where it says "None selected" to choose an identity profile. Next, the app will list your available identity profiles. Choose the one you want to associate with this OpenVPN connection. Configuration is now complete. You can connect to your OpenVPN server using the slider on the screen. where you have to replace property and newvalue with what you want. if you migrate from SME8 to SME9 and are not able to connect after correctly migrating your certificates, this might be related to not secure enough algorithm. CentOS 6.9 release notes state that "Support for insecure cryptographic protocols and algorithms has been dropped. This affects usage of MD5, SHA0, RC4 and DH parameters shorter than 1024 bits." Of course real solution would be to migrate all your certs to better algorithm. This page was last modified on 15 January 2019, at 02:56.